Kerry Kelly swimming the Butterfly for the Dutchwomen. 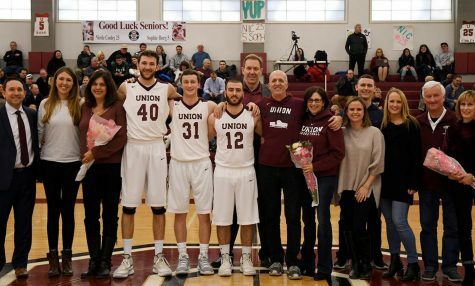 Photo courtesy Union Athletics. On Friday, January 18, the men’s and women’s swimming and diving team took on Rensselaer Polytechnic Institute. The team suffered a loss with a score of 77 to 221 on the men’s side and 126 to 172 on the women’s side. Despite the losses, the team still had very strong performances. The team started the meet with a strong start in the 1,000 yard freestyle. Emilee Nason ‘19 and Cara McCarthy ’19 led the field with first and second place finishes of 11:08.31 and 11:17.19 respectively. Mary Tonaszuck ’22 took fifth in the event. On the men’s side, Jack Wassik ‘19 took second with a finishing time of 10:20.40, closely followed by teammate Zach Cormier ’22 who finished third with a 10:20.78. In the 200 freestyle, Anna Lehr ’22 swam a 2:03.17 and snagged a second place finish in the event. The women’s team had a strong performance in the 100 yard backstroke. Elise Liebow ’22, Zoe Lyon ’22 and Jen Nutter ’19 were third, fourth and fifth in the event. Emily Quinn ’20 and Tommy Han ’19 placed second and fourth respectively in the 100 yard breaststroke. Kerry Kelly ’20 gave the tea m its first win of the night by winning the 200 yard butterfly with a time of 2:10.54. Seif Refaat ’20 almost won the men’s 200 yard butterfly, but he was just out touched by his RPI competitor, giving him second place by two seconds. In the 50 yard freestyle Jess Frigon ’22 and Jen Nutter ’19 tied for third with a time of 26.75, while Andrew Mungovan ’22 was second on the men’s side. Concluding the first half of the meet, Amanda Lopez ’21 finished second on the 1-meter board with a score of 237 and Anna Gagion ’19 was third with a score of 214.05. Davis Harrington ’21 blew away the competition on the men’s 1-meter board winning the event with a score of 335.86, beating his closest competitor by over 100 points. Starting off the second half off the meet, freshmen standouts Jess Frigon ’22 and Tim Fagen ’22 both placed third in the 100 yard freestyle. The trio of women’s backstrokers, Jen Nutter ’19, Elise Liebow ’22 and Zoe Lyon ’22 took places 3rd through 5th and Zach Cormier ’22 took second on the men’s side. In the 500 yard freestyle, Kerry Kelly ’20 went a 5:16.29, fast enough to win the event. She was followed by teammate Anna Lehr ’22 who was second. Kerry Kelly ’20 also went on to win the 200 yard individual medley. Emily Quinn ’20 had an outstanding performance in the 200 yard breaststroke, placing second and won the 100 yard butterfly with a time of 1:02.87 later on. In the men’s 500 yard freestyle, Jack Wassik ‘19 was second and Hunter Reinhardt ’21 was fifth. Seif Refaat ’20 also had exceptional performances in the 100 yard fly, as he placed second with a time of 53.28 and third in the 200 IM with a time of 2:05.05. The women’s 3-meter board resulted in Anna Gagion ’19 finishing second with a score of 229.27 and Amanda Lopez was third scoring 197.62. Davis Harrington ’21 dominated the boards again as he also won the men’s 1-meter board scoring 279.67. The night concluded with the 200 yard freestyle relays. The women’s relay consisted of Jess Frigon ’22, Elise Liebow ’22, Annie O’Donnell ’21 and Jen Nutter ’19 and placed second with a time of 1:46.95. The men’s relay of Andrew Mungovan ’22, Tommy Han’ 19, Tyler Mar ’21 and Jack Wassik ‘19 placed third with a time of 1:30.72. The swimming and diving team will return to action on Wednesday as they face Hamilton in Clinton, New York.